Ever since I’ve been eating healthier, and sleeping better, I’ve managed to find my stitching mojo on a regular basis. As such, it’s seen a bunch of finishes over the last two months – most of them new starts, with one UFO from the start of the year. 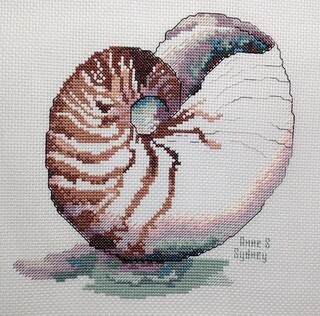 The last one, hot off the Qsnaps on Friday night was one I’d originally stitched as a charity quilt square a few years ago. I’ve been wanting to restitch this for myself ever since, and still had the DMC sitting with the chart ready for the day when I found time. I decided it was finally time to pull my finger out and get it stitched up so I grabbed some fabric and threw it on the Qsnaps – I love this one, and it’ll beautifully with my ocean/beach theme in the lounge! Only 2 days to go before the September WIPocalypse post is due … oops … life sure has a way to interfere with plans, and my memory is shocking, so yet again I’ve missed the deadline. That doesn’t mean I haven’t been stitched, although I have to admit I haven’t been stitching as much as I normally do. Work pressures have yet again put a hold of any mid-week stitching, although each weekend I’ve made sure I’ve had one day dedicated to stitching my little heart out. 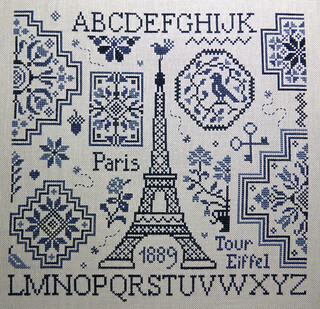 First up I decided to just keep on stitching on my Eiffel Quaker until it was finished – I just love this one! And then my final finish took place yesterday – I only had about 3 hours of stitching left in my ‘small/medium projects’ slot, but I opted to just keep stitching until I finished it (hence my comment about ‘loosely’ following my rotation!). 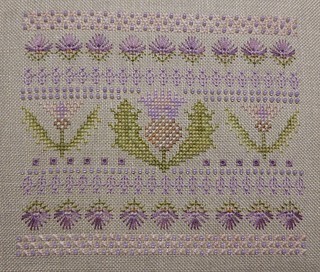 This was a real joy to stitch, with some good challenges, and it just needs to be made into a little pincushion now. Well, I guess my oldest one now is probably Stoney Creek’s Natures Rest. This is possibly one that will never ever be finished – aside from making a massive blue on the tree stump and the need to frog a huge section, because I can’t work out what was wrong and what was right, it was also using some older threads that I no longer have so there’s every likelihood that I will have mis-matched dyelots and this will show, especially with the greys. I don’t have too much love for this old project (my first ever on evenweave fabric, and I didn’t follow the instructions properly so I used 2 strands of thread in the background instead of 1 strand …). Whatever could go wrong with this piece, it certainly did – and it remains relatively unloved because of it! 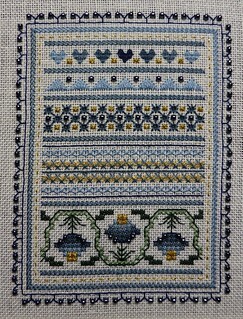 My newest WIP according to my rotation records is a canvaswork piece called Sand and Surf by Northern Pine Designs. My canvaswork rotation is coming up soon, so I can’t wait to get back into working on this one again. I have a feeling I won’t stop until this one is finished, as canvaswork tends to go quite quickly with some of the big chunky stitches. I have to admit over the years I’ve given most of my stitching away – over the last 10 years, though, I tend to stitch more for myself with the odd gift given out. I like to stitch gifts for people, but as soon as I make a commitment to do something my brain goes into meltdown and it removes the enjoyment of stitching for me – I’d much rather stitch something then decide after it’s finished to gift it to someone.